Rachels research interests focuss on how organisations can transform learning and experience into durable capabilities for innovation.Her works contributes to developing organisational capability theory and especially the nascent theoretical area of dynamic capabilities. She has applied this to understanding the capacity of firms to adapt environmental innovation. She also researches the role of capabilities at the regional and national level, including governance capability of national systems. She has previously held visiting fellowships at the Science Policy Research Unit (SPRU) at Sussex University and at the Centre for Innovation, Research and Competence on the Learning Economy (CIRCLE) at Lund University, two of the leading centres for innovation studies in Europe. She was a member of the TASC expert working group and industrial policy commission. 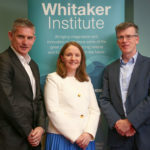 She leads the Innovation & Structural Change research cluster at the Whitaker Institute. Rachel has supervised PhD students looking at the areas of inter-organisational learning, mechanisms for knowledge transfer and capabilities for environmental innovation. Rachel lectures in the area of innovation and entrepreneurship. She enjoys introducing students at all levels to the excitement of using start-up techniques to solve real world problems. She has worked on these projects with primary school children in the Youth Academy, postgraduate STEM and business students, as well as executive MBA students. Rachel has also pioneered a range of writing development initiatives for staff and students. She leads the Thesis Boot Camp programme at NUI Galway, providing an intensive writing workshop for PhD students. She also leads the Whitaker writing retreat for staff. Rachel has worked as a lecturer in Management at NUI Galway since 2002. She has served as Associate Head of School with responsibility for developing the School's research culture and profile. She is also an Associate Academic Director of the AUAs suite of technology management postgraduate programmes: MSc in Technology Management, Diploma in Technology Commercialisation, Diploma in Innovation Management. Rachel is the Vice-Dean for Graduate Studies for the College of Business, Public Policy and Law. She is a founder member and Co-Chair of the University Women's Network. Rachel Hilliard holds a BCommerce from University College Cork and an MA in Economics of the European Union from the University of Exeter. She completed her PhD, Learning to change: the role of organisational capabilities in industry reposonse to environmental regulation, at Dublin City University Business School in 2002. She has previously worked in industry, as a researcher on a European international project at QUB and as a lecturer in DCU. (2010) EPA Cleaner Greener Production Programme: Experiences, Impacts and Outcomes for Participant Organisations. (2009) Sustainable Development  Environmental Technology, Dynamic Environmental Capabilities and Competitiveness.